The tiny country of Gambia had a president who lost an election but refused to give up power. He was told to leave willingly or West African troops would oust him militarily. As Senegalese troops crossed the border, the former president Yahya Jammeh ended his 22 years in office by flying to exile in Equatorial Guinea, taking with him the goodies he had accumulated. The man elected as president in December, Adama Barrow, returned home on Thursday from exile in Senegal to cheering crowds. ECOWAS, the Economic Community for West African States, is telling leaders they are subject to military intervention if they defy election results or initiate a civil war. The alliance intervened in Liberia in 1990 and then in the Ivory Coast's post election crisis in 2011. But Reed Brody, a human rights lawyer, said that although "ECOWAS' decisive action is definitely a warning to dictators, the signs are still very uneven if we look at the passive reaction to a stolen election in Gabon (in West Africa) and the overriding of term limits in places like, Rwanda, Uganda and most recently, Burundi" in central and east Africa. Brody, who was instrumental in the recent prosecution and conviction in Senegal of the former Chadian dictator Hissene Habre, said that The Gambia was a small country with a small army in a more democratic region of Africa, so the cost of intervention there was relatively low. "If you want to stay in power forever, you'd better be sure that you have the support of your neighbors or the might to resist them," he said in an interview. Troops from Senegal which surrounds Gambia, the smallest country on the African continent, were the first to cross the border and other countries from the region followed. "One of Jammeh's biggest mistakes was that he pissed off his big neighbor Senegal by supporting rebels in the Casamance region. Senegalese speak the same language as Gambians (Wolof) and follow Gambian events closely," Brody said. "They correctly saw Jammeh as a brutish and buffoonish dictator and were very supportive of their government's moves to get rid of him," he added. Alex Vines, head of the Africa Program at the London think tank Chatham House, said a key lesson was the importance of "youth and civil society pushing for change"
"This played a role in Nigeria and Ghana and now Gambia," he was quoted as saying. Barrow, a real estate entrepreneur and a strict Muslim, who has two wives and four children, had been inaugurated in the Gambian embassy in Senegal. He arrived home to dancing crowds with troops and jets from Senegal and Nigeria guarding the airport. Many Gambian military officers are believed loyal to the ousted president. To force Jammeh to leave peacefully and escape prosecution, the West Africans, the African Union and the United Nations allowed him to keep the goodies he as well as his cabinet ministers and party supporters had amassed, mainly at the expense of the impoverished country. They included a fleet of luxury cars and other goods, variously estimated at $10 million. Brody however said perpetrators of torture or systematic killings can't have their crimes erased in a declaration should someone want to prosecute. Jammeh has a history of torture that his successor, Barrow, vowed to undo. The UN Security Council, in an emergency session on December 17, refrained from endorsing a military intervention but it backed ECOWAS' activities. In a 15-0 vote, it "expressed its commitment to ensure, by political means first, the respect of the will of the people of The Gambia as expressed in the results of 1st December elections." This was hint to allow military action but not quite. Peter Wilson, the deputy British ambassador, told reporters told reporters that on the question of force, the new president could request it. "If President Barrow asks for assistance then that is something that as the legitimate President of Gambia he is perfectly entitled to do," he said. Gambia, which boasts lovely beaches that attract tourists, is bordered to the north, east and south by Senegal with a small outlet to the Atlantic Ocean in the west. Before becoming a British colony, it was occupied and pillaged by several European powers and Arab traders. 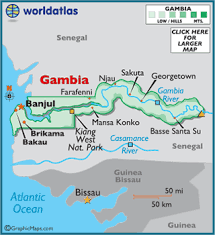 To Americans Gambia became famous in Alex Haley's novel "Roots" and the story of Kunta Kinte, an 18th-century African, captured as an adolescent and sold into slavery in the United States.